This concept had the highest priority during the development of the SAPHIR 3D measurement and analysis software. 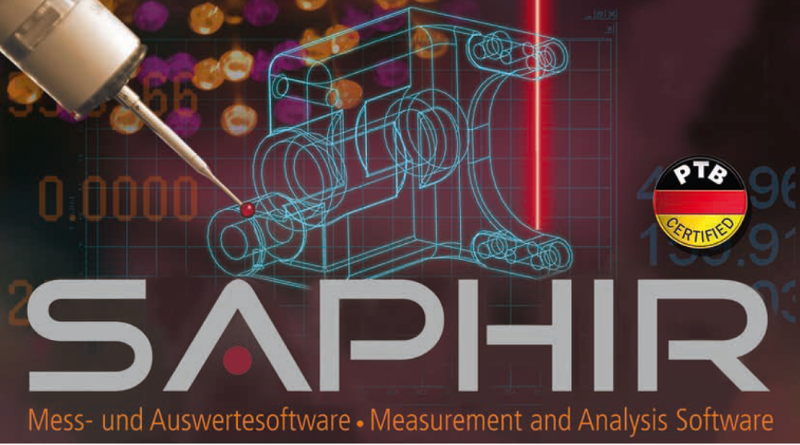 The implementation capability into the complete range of multisensor measuring machines, workshop microscopes, optical measurement devices and measuring and profile projectors and the complete integration into existing environments vouch for the high flexibility and adaptability of SAPHIR. Since 1983, the software has been continuously optimised by our development team to meet the changing demands of the market, and new functions are integrated with great far-sightedness. SAPHIR is today one of the most widely recognised products for this field of application. The measurement software certified by the German Federal Institute of Physics and Metrology (PTB) impresses with its clear structure and simple operation. Thanks to its structure, SAPHIR is extremely reliable, highly flexible and offers multisensor capability for universal application. The detail determines the precision of the whole system – but for the rational measurement of the detail, the choice of the right measurement sensor is absolutely crucial. The SAPHIR 3D measurement and analysis software was designed to meet these demands from the outset and uniquely permits the use of a wide range of sensors in one software package. No matter whether you have to measure coarse of finely toleranced, matt or polished, bright or dark workpieces, the right sensor is available at all times. Black/white or colour camera for incident light and transmitted light measurement, programmable LED sector incident light illumination, tactile or scanning probes (alternatively with swivel head system) or a high-precision measuring laser are the elementary preconditions for purposeful and cost-optimised use of the measuring machine. All the sensors can be automatically changed and employed during the measurement routine without having to stop or change the measuring programme. One software for all sensors – efficient and user-friendly to allow the operator to concentrate fully on the measurement application. Too short at the back, too long at the front – with 2D and 3D BestFit, you always get things right. Optimum integration of the measured actual data into the 2D target data dictated by DXF. This allows you to make optimum use of the tolerances. As an option, 3D formats such as CATIA, AutoCAD (DWG), 3DStudio (.3ds), Lightwave (.lwo), Step (.stp, .step), RawTriangles (.raw), STL (.stl), VDA (.vda), VRML (.vrml, .wrl), Wavefront (.obj), PDF (.pdf, .ai, .eps) and TXT (.txt) can also be processed. A BestFit is possible with both the 2D model sections obtained and with summarised control geometries and 3D free-form surfaces.